I updated you about the specs of Nokia Sea Ray that is a Windows Phone 7.5 Mango smartphone but now I have something more interesting for you. 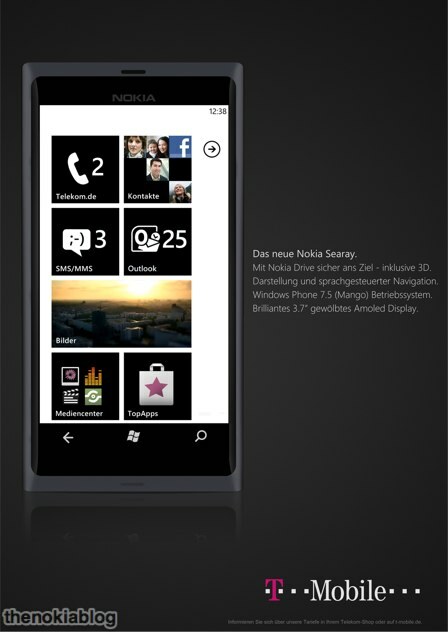 I have a stunning image of Nokia Searay for Nokia Searay for T-Mobile Germany and this image has just hit the web. Although there is no official word about this handset as yet from the Nokia but now it is quite clear that first time Sea Ray will be launched at Nokia World 2011 by the end of October. I have some more details of Nokia Searay which come to me through this T-Mobile Germany description. It will feature with 3D navigation, voice navigation, Windows Phone 7.5 Mango and a 3.7 inch AMOLED display. if you looked at the image then you will notice that Nokia Searay bears striking resemblance with Nokia N9 and it is a good thing. The design of Nokia Searay looks hot and stunning. If you want to know the specs of Searay , Ace and Sabre then just follow the link.